We are pleased to see lots of people taking photographs of our display plants and this plant has been photographed a lot. 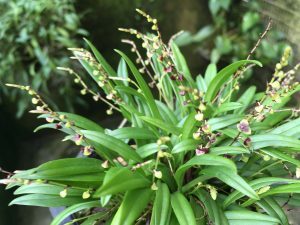 This tiny stelis species is native to Ecuador and Venezuela where is grows as an epiphyte in moss and produces an abundance of short spikes and a mass of flowers. We grow the species in baskets and in pots and it seems to do especially well in small baskets where it enjoys daily watering but plenty of fresh air.